In this image of galaxy cluster SDSS J1038+4849, there seems to be a happy face smiling back at the camera. In reality, gravitational lensing created the curve of the smile. 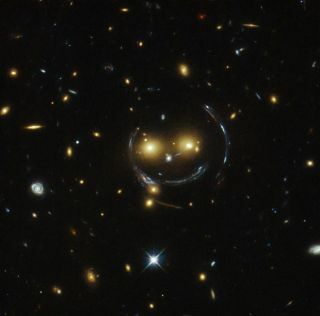 The universe is smiling today — at least, that's what it looks like in a new space photo that appears to feature a smiling face emerging from the light of the universe. The Hubble Space Telescope snapped a shot of galaxy cluster SDSS J1038+4849 in which the cluster appears to be looking back. Two bright dots look like eyes, another like a nose, and curved lines of light create a mouth and the outline of a face. Altogether, they create the impression of a happy face in the galaxy cluster. In reality, the two "eyes" are each a distant galaxy, and the curved lines come from light that has been bent by gravity around the galaxy cluster — an effect known as gravitational lensing. Einstein's theory of general relativity showed that massive objects can actually bend the space around them. When light passes through this bent region of space, it can be redirected, magnified or distorted, as if it had passed through a lens. Galaxy clusters are some of the most massive objects in the universe and can create strong gravitational lensing effects, according to a statement from the European Space Agency's Hubble collaboration. In the case of the cosmic smiley face, the galaxy cluster and the distant light sources are perfectly aligned with Hubble along a straight line. As a result, Hubble sees what's called an Einstein Ring, in which the light from the more distant object is smeared out along a circular path. This creates the "smile" as well as the curve around the edge of the face. Astronomers sometimes look for signs of gravitational lensing in order to identify massive objects that might not be visible otherwise, including black holes, galaxy clusters and even dark matter.